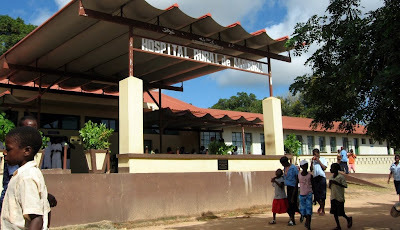 A tremendous cacophony rumbled through the Hospital Rural de Mocuba as a troupe of vervet monkeys rattled across its corrugated iron roof. The village of Mocuba was to be the botanists’ last stop-over, the last outpost of civilization, before they reached the forests of Mount Mabu. ‘I’m surprised by how organized everything is. I kind of wasn’t expecting that,’ Alan said, idly scratching at an insect bite. ‘Antiretroviral treatment program,’ Eduardo explained, without elaborating. In northern Mozambique, living with HIV is seemingly as normal as living with pollen allergies in Cape Town. ‘Come, I show you cholera ward. Is new.’ Alan and Olivia followed Eduardo down a long unlit corridor. In the hallway was a little bench on which five women, dressed in colourful skirts and tattered T-shirts, were waiting to be seen by a clinical officer; they passed them in silence. Both botanists were sweating, but the small Portuguese doctor didn’t seem to notice the heat or the humidity at all. They turned into a large room that smelled of fresh paint, containing forty low stretcher beds in neat rows. ‘European Union initiative,’ Eduardo said, gesturing to all the empty beds. ‘Now after the civil war, is possible for Mozambique to prosper. ’ Each stretcher bed had a circular hole cut into the canvas, with a plastic tub positioned underneath it. Alan briefly thought about what the plastic tubs were for, and shuddered. He could tell by the look on Olivia’s face that she had thought about it, too. ‘Seems like you’re ready for the worst,’ she said weakly. ‘We had a big cholera outbreak in the spring. Many hundreds of people were brought here, but is not possible to treat them with drugs. This cholera is resistant to tetracycline antibiotic, you see. Is only possible to give oral rehydration therapy. Then we hope for the best.’ Alan desperately wanted to go outside. The paint fumes were giving him a headache. It was time to leave the village. ‘Dr. Texeira, it’s been a pleasure and an honour to stay with you and meet your family. May you continue to do good work here at the hospital,’ Alan said, shaking Eduardo’s hand. ‘Give my love to Christina. She’s been so kind to us,’ Olivia said. Pressure drops. Temperature rises. It was still sunny, but thunderclouds the colour of basalt were piling on the horizon, beyond the plots of cassava and fields of sugarcane. The Land Cruiser was loaded and ready, but Olivia wanted to buy sundried fruit and cashews from the roadside vendors before they left. There were children everywhere: balancing rusted scrap metal on their heads, laughing; chasing chickens; kicking a weathered football around, their toes stained red from the dusty streets. It was so hot. They walked past a crumbling Portuguese church, shot to pieces twenty years ago and never rebuilt. Some houses had roofs of corrugated iron, others were thatched with palm fronds. All had stands of banana and papaya growing by the front door. Alan caught himself wishing for a moment that he could share this with Daniel, that Daniel was with him. A group of girls were washing clothes in the Licungo River. Although Alan had been told stories, he hadn’t actually seen any crocodiles on its banks so far, nor did the girls seem much concerned by the possibility of reptilian predators lurking in the brown water. The shacks were built right up to the banks of the river, right among the reeds. They would most certainly all be submerged during a flood, he thought. He was right. This is the place where nature wipes the slate clean. This is the place where people start anew, building on yesterday’s tragedy.